Music aficionados are never left behind in the Panorama, with several films tackling the world of music each year. The fifth round in 2012 included the Swedish-British production Searching for Sugar Man, an Academy Award winning documentary exploring the rumoured death of American singer-songwriter Sixto Diaz Rodriguez. That same year also offered Safinez Bousbi’s El-Gusto, a film that documents Chaabi music in Algeria’s pre- and post-revolution years. In 2013 Dustin Hoffman’s directorial debut, Quartet, told the story of the residents at Beecham House, a home for retired opera singers and musicians. In 2014, a Wim Wenders retrospective included Buena Vista Social Club (1999), a documentary that paid tribute to some 20 musicians had been Havan’s shining stars in the 1930s-50s. Amy Winehouse was the subject of the Academy Award winning biopic Amy in 2015. This year, the Crossroads section presents Rough Stage, a film about a former political prisoner from Palestine who, while overcoming many challenges, works on a contemporary dance performance in Ramallah, while the Documentary Rendezvous section presents the French documentary Reset: A Story of Creation, a somewhat less politically focused. Screened on 5, 7 and 10 November (the first show attended by the filmmakers with a discussion of the work following the screening), Reset (2015, nominated to Most Popular Documentary at the Melbourne International Film Festival in 2016) is directors Thierry Demaizière and Alban Teurlai’s unique perspective on the famed Paris Opera Ballet (Ballet de l’Opéra de Paris), a company with a weighty history which 20th century developments placed in constant comparison with Moscow’s Bolshoi Ballet and London’s Royal Ballet Company. However, while each long tradition adds important values to any artistic company, it can also cast a heavy shadow on its development and artistic vision. Above all, it can challenge its ability to adapt to the world changing, in terms of technology and art. This is where Benjamin Millepied steps in. A French-born dancer and choreographer adopted by the School of American Ballet and then the New York City Ballet – also an initiator of the LA Dance Project – Millepied thus becomes the protagonist of this documentary. Known for his role in the Darren Aronofsky’s Oscar-nominated psychological thriller Black Swan (2010), the set on which he met his future wife, Natalie Portman, Millepied’s journey through the world of dance led him back to France where in October 2014, he took the position of the Paris Opera Ballet company’s artistic director. While the apparent main purpose of Reset was to capture the final 39 days of the making of Millepied’s contemporary ballet Clear, Loud, Bright, Forward (to the music of Nico Muhly, an American contemporary classical music composer), the filmmakers also look behind the scenes of the Paris Opera Ballet company’s artistic journey, shedding light on the traditional artistic and managerial dynamics that cripple this institution more than they allow it to grow. 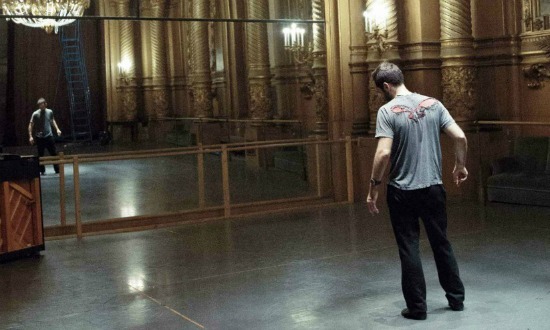 As he works on his ballet, Millepied – a true maverick – has to navigate the decades-old orthodoxy of habits and negotiate his way through the conservative artistic hierarchy. Cutting through the conservative minds that surround him, Millepied implemented many changes which he believed were necessary for the well being of the company, from revamping the repertoire to opening the door to hitherto underestimated dancers from the corps de ballet, and building Clear, Loud, Bright, Forward uniquely on their strengths. 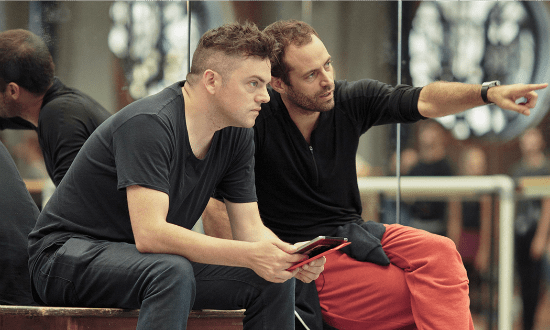 Millepied also worked on improving the work conditions through changing the dance floors and launching sessions with physiotherapists and nutritionists for the dancers, to name but a few reforms. On a broader managerial level, he raised over one million Euros in his first season’s celebrity-filled gala, a shockingly high amount in the company’s history. Recognising technological progress, he laid plans to invigorate the social media department. A young and dynamic creator, he managed to introduce a new artistic culture to the company even if it was only for a short time. For Millepied the reforms were necessary to ensure the company’s continuation and, more importantly, to attract the funds and so secure the ballet’s future. Those shocking and fast paced reforms brought Millepied a few friends, but also gave him many enemies. The latter saw in this unwanted American in Paris a man trying to bend the rules and challenge the company’s unshakable heritage, never mind that this heritage was proving increasingly irrelevant in a modern and highly competitive world. The press has abundantly covered Millepied’s troubling relations with the company and his eventual resignation; the filmmakers chose to focus on the positive aspects of his term in Paris. Reset is an interesting look behind the scenes of both the managerial and creative aspects of a ballet company. As we follow the choices made by the filmmakers, we see how the tradition, artistic hierarchy, rigid principles that dominate the company, do not support the creative development of its members. We begin to dig out the buried truths, moving backstage, following the fast paced rhythm of the offices and meetings; then we begin to sense many points subtly implied by the filmmakers, a few directly stated. And in this network of relations, where we see Millepied showering the dancers with love – another unconventional technique in the world where the traditional school involves a lot of disciplinary harsh measures, shouting etc – we also witness art in the making. Millepied was loved by the dancers, and this mutual tenderness is well captured by the filmmakers. “We’ve been pushed since we were kids and we push ourselves. There is a need to please and fear of judgment, the gap between the lead dancers and the corps de ballet,” one dancer reveals in the documentary. “In the corps de ballet, there is no room. But in a duet, there is total freedom,” another adds. At the same time, however, the relations between Millepied and the stars of the company are missing from the picture. Equally, the point of view of the old school management — as the film implies — is not depicted directly since the camera always presents the Millepied’s perspective on the company, its challenges and developments. Consequently, as if deciding to respect some secrets, Demaizière and Teurlai lift only a small corner of the veil, just enough to give us a basic look behind the scenes wrapped in an aesthetically beautiful cinematic experience. Same applies to the dancers themselves. Even if, on the way, we do get a hint of the dancers’ hard work, hesitations and fears, the filmmakers chose to look at them from a safe distance. Too often the ballet has been synonymous with pretty ballerinas and charming tutu skirts, and its most captivating visual aspects powerful enough to make us immune to media reports of what happens behind the scenes. As art lovers, we tend to overlook those news reports as if they were not emerging from the same field. It is obvious that the French filmmakers chose to keep some hidden truths intact. In Reset, the characters might hint at some challenges, yet in the beauty of their cinematography the darkest shades of the ballet world are concealed. We do not find any traces of an unhealthy lifestyle and fierce competition; there is no highlight on recurrent career-ending and life-shattering injuries, no testimonies to artistic fiascos, anxieties and addictions. The filmmakers focused on the core challenge faced by Millepied in Paris: the company’s malfunctioning resulting from decades of the traditional approach to art and managerial priorities. As we read in press from those months, those are the obstacles that eventually lead to Millepied’s resignation from the Paris Opera Ballet on 4 February 2016, only four months after the Clear, Loud, Bright, Forward premiere: the moment when the Demaizière and Teurlai’s film ends. Still, we definitely learn a lot from the Reset documentary, and no matter how little the viewer is given in the way of secrets, it remains an important document speaking of the company’s history and a reflection of a very unique world. On the cultural level, the film is a testimony to a creative marriage that went wrong or maybe a relation that wasn’t a good idea from the beginning. Raised on American ballet principles and realities, Millepied didn’t fit in his native land’s opera dynamics and fell prey to the clash of creative cultures. During the discussion that followed the Zawya screening on Saturday 5 November, the filmmakers revealed that they had to make choices from over 200 hours of footage from the Paris Opera Ballet. Demaizière and Teurlai chose to create a highly aesthetic – and no doubt very enjoyable – work. In it, the dancers are joined by love and a belief in their choreographer’s vision, so much so that they appear to be no longer human but seem to emerge from Degas’s paintings. The dancers’ sweat is a beautiful part of the artists’ dedication to their craft, rather than a fight for survival with anxieties, while a minor strain in one dancer’s foot is forgotten amidst the atmosphere of love and splendour. Indeed, Demaizière and Teurlai deliver an ode to beauty, as graceful and elegant as the art of ballet is.